The Lighthouse Interpretive Centre (LIC) is located at the end of Lighthouse Lane within the shadow of the historic Presqu'ile Lighthouse. It is a unique blend of old and new architecture as the modern air-conditioned building incorporates the original lighthouse keeper's cottage, built in 1846, into its design. 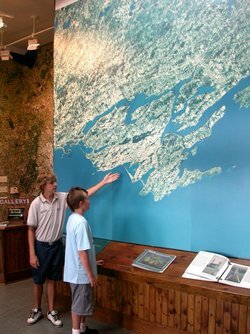 This centre features the Park's cultural heritage and its relationship to Lake Ontario's history through a number of multi-media displays. Meet Jack Atkins, the last farmer on the peninsula, as he tells you the story of Presqu'ile and his family's role in its history. Re-live the terrible tragedy of the sinking of the Speedy in our video re-creation, or join a dive team as they explore one of the numerous ship wrecks offshore of Presqu'ile. You can also take in displays on the creation of the Murray Canal, the dangerous rum running era of the 1920s, as well as the building of the Lighthouse. One can't help but notice the spectacular satellite image of Presqu'ile and the north shore of Lake Ontario that dominates the foyer when you first walk in. Studying this map will give you a greater appreciation of the influence Lake Ontario had and continues to have on Presqu'ile's development. The Lighthouse Interpretive Centre is open 10:00 am to 5:00 pm every day between Canada Day weekend and Labour Day weekend and 10:00 am to 4:00 pm on weekends in spring and fall. It can be opened for group/school tours during the off season upon prior request, subject to staff availability. In 2013, The Friends started providing free wifi, available for about six months beginning in May, and this service continues to have The Friends' support. Please call in at The Friends' Gift Shop and ask for the current password. The Friends' Lighthouse Gift Shop, operated by the Friends' of Presqu'ile Park, is also located in this building, selling both educational materials and quality Presqu'ile souvenirs. It is through the financial support of The Friends that the numerous displays found in the LIC and elsewhere are possible. Click here for more information.